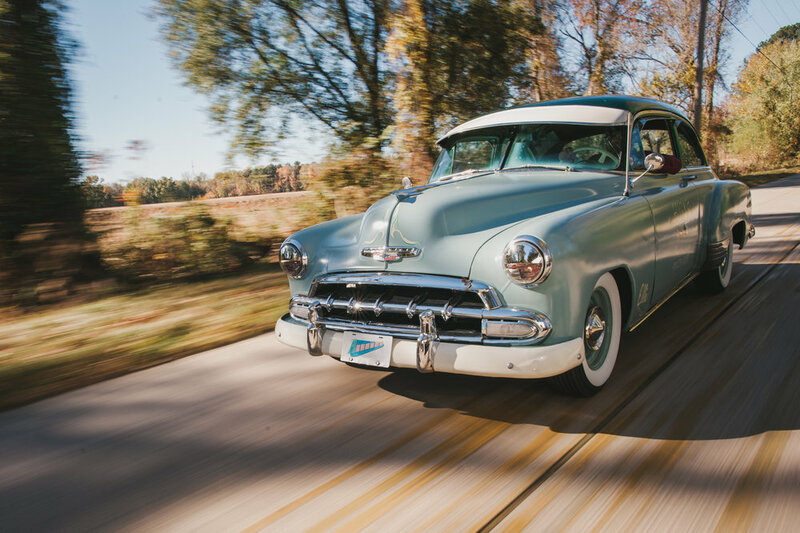 I can't believe it has been three years since I first photographed Brent's 1952 Chevrolet. When he originally purchased the car, he was planning on keeping it as-is, as a side project to his '49 build. When he ran into issues with the engine, however, he went full in and has really transformed the car. This shoot was originally for an online publication, but that fell through, so I just wanted to share it with y'all. Brent is awesome dude, and his creativity is second to none in the area. Although Brent changed the direction away from the patina of the car as he found it, he has stuck to his guns of keeping the Chevrolet has a period-correct "hot-rod" build. To hear him say it, his goal to build a car that he would have built if he had bought the car in the fifties. The level of details, from the pin-up artwork to his own pinstriping, it all just works perfect and transports you back to mid-century America. As great as this car is, Brent will tell you that this isn't the final look. I love that he's constantly changing things and reinventing his projects, always introducing something interesting but staying true to the same fifties hot-rod theme. I first spotted Justin's Corvair a couple of years ago at the gas station down from Mercer, and honestly, just loved it. It exuded style, especially when compared to the transportation appliances that fill modern roads. I didn't have a chance to meet Justin until a few weeks ago when I happened to spot him getting out of the car along Tattnall Park when I was out on a bike ride. I introduced myself, gave him a card, and offered a shoot. For this shoot with the Corvair, I wanted to keep the aesthetic rough. The car is unrestored, and seeing as Justin was smack dab in finals, he didn't have time for a detail. I decided to use Fuji Superia 400, a grainy, consumer-grade film that would flow with the lo-fi vibes of the car. These rolls were shot with my Nikon F100, and processed by The FIND Lab out of Utah.